Ten minutes into Penash Productions’ Promise and Promiscuity: A New Musical by Jane Austen and Penny Ashton at the Toronto Fringe Festival, I knew I had to see it again. It was just that good — brilliantly performed, absolutely hilarious, and by far the best one-person show I’ve ever seen. 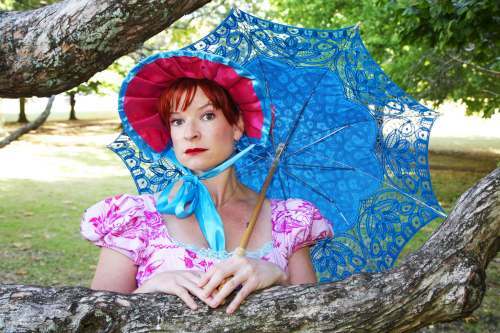 Penny Ashton tutted, blushed, danced, and pranced her way across the stage in a tour-de-force musical based on characters in the style of Jane Austen. This was a one-woman show, but you’d never know it from the extraordinary ensemble of characters (eight!) in the play. As much as I loved the strong-willed heroine, the awkward younger sister, and the cartoonishly repulsive cousin, my favourite character was the hero’s snobby mother. Her constant pursed-lips expression of disapproval was simply hilarious. Promise and Promiscuity: A New Musical by Jane Austen and Penny Ashton was surely solo theatre at its best. Each character was memorable and distinct. Although Ashton shifted constantly between them, her physicality and voice were so well-controlled that I never had trouble telling her characters apart. It’s worth mentioning that dialogue was delivered rapidly and, of course, in Ashton’s native New Zealand accent. As a native English speaker familiar with New Zealand accents, I didn’t have trouble understanding her, but that might be an accessibility issue to keep in mind. Ashton’s microphone was spitting static on the night I attended, but she deftly turned it into a running gag by joking about it in character. A too-early music cue was handled in the same spirit. Ashton ended up describing how the interrupted scene was supposed to go — “Now I sit here for a while looking sad, and you feel sorry for me” — which got a huge laugh from the audience. After he had sat down, Ashton went on with the scene, playing both the heroine and the hero. I couldn’t believe my eyes. You haven’t experienced theatre until you’ve seen someone have both sides of a conversation while dancing both sides of a dance! From beginning to end, Promise and Promiscuity: A New Musical by Jane Austen and Penny Ashton was full of sly jokes, double entendres, and winking references to contemporary people and events. No matter which character she was portraying, Ashton brought an irrepressible playfulness to the stage. Jane Austen fans will especially love the 33 quotations sprinkled throughout the show, but every theatre-goer can appreciate the impressive stagecraft on display.